Who says you have to wait for a debit card? Open a KickBack Checking® account with a 3.25% APY and you’ll walk out with a ready-to-use debit card. Verve is the credit union that stands behind our name, always looking for ways to make sure you have what you need by constantly challenging ourselves to find better ways for you to take care of your money. 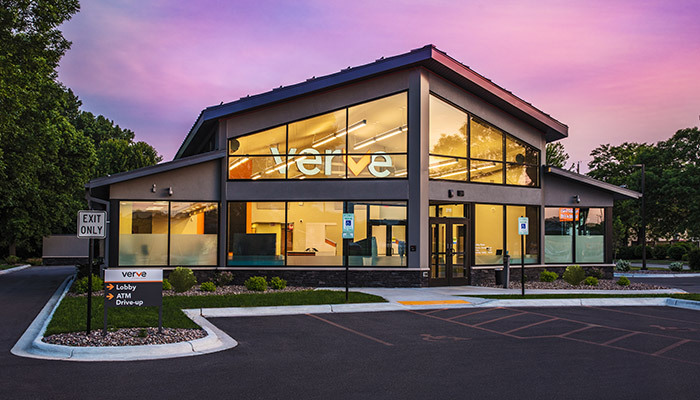 It’s no accident that Verve rhymes with serve, because that’s what we’re here to do—whether inside a local branch or out in the community. Merv is our straight-shooting (and a little quirky) spokesperson who represents the fact that we pride ourselves on breaking the norm for financial institutions. Whether you need to know about checking accounts, loans, debit cards or business tools, just ask. You have goals and we can help you get there. Because your financial institution should have as much energy as you do. Bank online, from your smartphone or at one of our 15 locations. We’re member-owned, which means you get a say in what happens here.